Rob Rock is back with his fourth solo album, Garden of Chaos. After being a fantastic, yet often under recognized pieces of some memorable metal releases over the years (Joshua, Angelica, Impellitteri, Avantasia, Warrior, and Axel Rudi Pell), Rob is finally starting to make a name for himself as a solo artist. Garden of Chaos intertwines many influences from Rob's previous work, while staying on course with the heavier direction that Holy Hell paved. Compared to Holy Hell, this album is more melodic, and features a more distinct 80's feel and sound. Of course, the mixing and production are top notch and very up to date, yet the guitar tone has a classic, 80's metal sound that is a natural and comfortable sound for Rob. Like Holy Hell, Garden of Chaos is a guitar based, hard and heavy release. There are some keyboard textures lightly mixed in from time to time for atmosphere, but the riffing and soloing are clearly the backbone of the songs. Despite the heavy, guitar driven approach, Garden of Chaos maintains a strong sense of melody, not too far from Rob's debut solo album, Rage of Creation. It would be unfair to this album to try and pigeonhole it as another melodic metal album, or simply the continuation of Holy Hell. Instead, I do believe that Rob has reached into many corners of his previous experience, and melted them together in a single album that sounds fresh and exciting. For example, Garden of Chaos and Satan's Playground lead off the album with a heavy exclamation point. The title track features periodic double bass bursts that have a German power metal feel similar to Gamma Ray, while Satan's Playground has a more classic, heavy 80's metal sound, very much reminding me of Ozzy's Over the Mountain, but drenched in the darker sound of Holy Hell. Savior's Call is a riff heavy, mid tempo track with a killer chorus that begs to be replayed. The keyboard texture here is very similar to that used on Sonata Arctica's highly acclaimed debut album. This Time is the Last Time is more of a heavy hard rock tune, driven by a steady, chugging riff, and another highly addictive chorus. Only a Matter of Time is another mid tempo, hard rocking cut. With this track, a very effective, yet limited keyboard presence punctuates the ominous mood. The guitar work, especially the soloing is very much grounded in 80's metal. Spirit in the Sky shifts the mood, as it is a very 80's melodic metal influenced song, with catchy riffs and rhythms paving the way. Brief, machine gun drum beats give the song a heavy feel despite the overall hard rock tempo used. The dual soloing just before the three minute mark coupled with the instantly recognizable (again) chorus makes the song a killer. The keyboards used here are again very modest in nature, and give the song a light progressive feel. Metal Breed is a pure, heavy metal anthem, as the title would indicate. The guitar work is very Judas Priest like, while Rob uses some gritty vocals at times, matching the feel of the song just perfectly. Millenial Reign shifts gears in a slight neoclassical direction, with a catchy and soaring chorus that sound of early Impellitteri. At about the 2:30 mark, a blistering guitar solo explodes in all its pure 80's metal glory. Unconditional and Ode to Alexander are two acoustic ballads that close the album. Typically, I am not a fan of Rob Rock's ballads, but I do think Ode to Alexander is an excellent and interesting arrangement. There is a slight symphonic atmosphere here, which blends nicely with the acoustic guitar. Some very expressive guitar solos make an appearance just beyond midway through the song as well. Unconditional, however, is a bit average, which is my usual complaint of Rob's ballads, at least during the course of his solo career. To say that the guitar work on this album is amazing would be an understatement. The riffing is tight, yet heavy throughout, and there are some fabulous solos that beg to be blasted through your speakers over and over again. Also, the drumming is a huge standout of the album for me. Even after several listens, the unpredictable drum work keeps me on my toes as there are no "filler" beats to be found. Even during the mid tempo tracks, techniques such as sudden machine gun blasts are used to give the song a heavy kick. Powerful double bass is used only on occasion as to not become mundane or repetitive. Rob Rock has always found himself surrounded by talented musicians. That goes for all the projects and bands he's been involved with over the years, as well as his solo career. Roy Z., Gus G., and Bobby Jarzombek are amongst those making guest appearance on this album. I would also say that the use of guest musicians helps to diversify the sound of this album as I have expanded upon above. 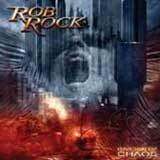 To date, this is my favorite Rob Rock album, but not by a wide margin. All four of Rob's solos albums are must haves for fans of traditional heavy metal, hard rock, and of any of Rob's previous bands. I like this album best because it combines the heaviness of Holy Hell (probably Rob's heaviest moment of his career) along with the best of his melodic side, and other sounds such as hard rock and even neoclassical. Despite this, the album is not at all disjointed. Instead, it flows along smoothly, yet never becomes predictable or stale. Of course, Rob's voice is in tip top shape, and the man has not missed a beat since his early days some 20+ years ago. I could have used another up tempo track instead of the ballad Unconditional, but that it a very minor beef considering the quality of the rest of the material at hand. Two thumbs way up for Rob and Garden of Chaos. This one will certainly find its way to a lot of "best of 2007" lists, I presume.